The “Gasteiner Tal” (Gastein valley) is a very popular vacation spot in Austria. Situated in the middle of the National Park “Hohe Tauern” at 1000 m.ü.M./3281 ft, Bad Gastein is a health resort with a unique atmosphere. Different ski areas as well as hot thermal springs and nice hiking paths draw many tourists every year. The location of the town in front of the gorgeous alpine panorama is ideal. 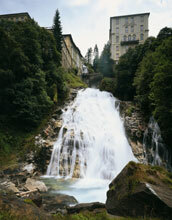 The Belle-Epoque-hotel palaces are a characteristic of Bad Gastein. The charm of this area remained. Visit this alpine resort and find out for yourself. The hot springs of Bad Gastein with temperatures between 44 and 47 degrees Celsius (111.2 to 116.6 degrees Fahrenheit) have already been used by the Romans. All treatments in the “Thermalkurhaus” are executed by educated personnel. Just relax and get healthy! If you suffer from rheumatism or respiratory disorders, make sure to visit the “Heilstollen” in Gastein, the most effective spa treatment you can imagine. A train drives you 2.5 km (1.6 miles) into the mountain, where you will stay at various stations (levels) with different temperatures (from 37-41.5 degrees Celsius / 98.6 – 106.7 degrees Fahrenheit). The secret of the treatment is the Radon content, the air humidity of 70 % to almost 100 % and the high air temperature. Of course, this natural therapy is constantly observed by medical personnel. Are you interested in mining and hunting? Visit the “Gasteiner Museum” with its impressive collection of minerals as well as exhibits of local customs (traditional wooden masks etc). There are two special treats for historian as well as culture lovers: In the Nikolauskirche from the 15th century there are well-preserved late gothic frescos and a baroque altar. The Pfarrkirche, built in the 19th century, shows treasures which are several hundred years old. Sculptures as well as the gothic wooden Madonna in the high altar can be admired. Feel the charm of the late historical period. Constructed between 1906 and 1909, it was once an exclusive hotel. If you like to play some roulette or try your luck at the Blackjack table, the casino of Bad Gastein is the place to go. Have you ever seen a waterfall in the center of a town? A great subject for a picture is the “Gasteiner Ache”, which can easily be found in the middle of Bad Gastein. The fall has a total height of 341 m (1119 ft) – in 3 levels. The stone waterfall bridge was built in 1840 and extended in 1927. Many famous painters and poets visited this natural treasure. Different ski areas offer something for everybody, for skiers as well as climbers. Why not test all the regions? (860-2300 m.ü.M / 2822-3546 ft). Enjoy the lengthy runs and make sure to drink some Glühwein after the longest run of 8 km (5 miles) with more than 1440 m (4725 ft) difference in altitude. (1590-2650 m.ü.M / 5217-8695 ft). The highest situated ski region. If there is a lot of snow you find many great tours to try. After 1000 m/3281 ft in altitude you reach the bottom of the valley of Sportgastein. (1079–2007 m.ü.M / 3540-6585 ft). This is the most difficult of the ski regions. Many slopes are in the forest and offer a good orientation even if the visibility is bad. (850–2003 m.ü.M / 2789-6571 ft). The family oriented ski region with an own fun park. There is also the possibility to measure your own speed/time on a special race track. Situated in the southwestern part of Austria, Bad Gastein is approx 1 hours’ drive from Salzburg and 2 hours from Innsbruck. Bad Gastein is also accessible by train. The closest airport is in Salzburg.